I saw these on another site looking for ideas to make spice bottles pretty, and loved the idea of etching paint. However I could not find it at craft store. These labels were less than $3 for 28 labels and chalk was less than $2. Though I love the chalkboard labels, I don’t like the chalk part after doing it. If you grab bottle wrong way it’ll smudge and you have to write the spice name again. Again it was cheap and I’ll work with what I have for now. Some of the herbs I’ve grown and dried have been camping out in ziplock bags. No fun!! I confess I did drink some of these Starbucks however some I still poured down the drain. Not waisting as to order brand new bottles would have been more expensive. I still have more to bottle, but it shall wait since I ran out of bottles. I still enjoy what I have though and can’t wait to cook again! 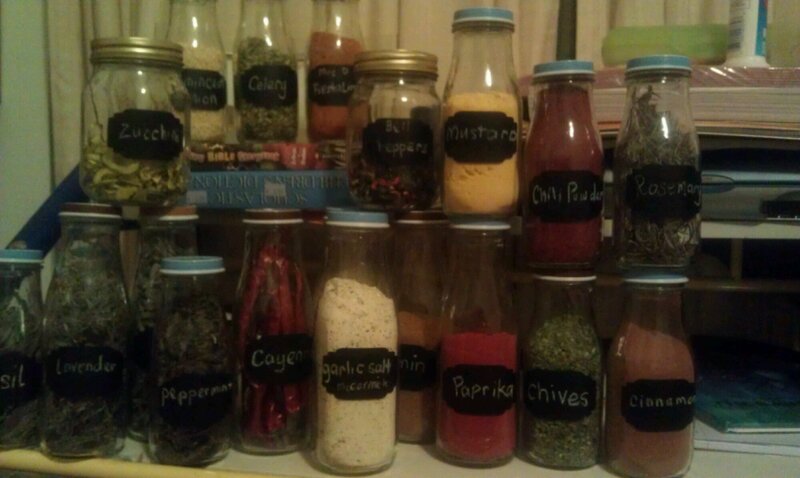 I love repurposing things around the house and it is very economical! !